This post comes from my brother Chris Philipson. I am always keen to keep abreast of mountain biking, although I sold off my own 26″ hardtail in 2011-12 to replace it with a with a multipurpose Kinesis winter road / cyclocross bike. The spirit of that purchase is evident in Chris’ own do-it-all mountain bike, albeit he has gone for the best kit he could get his hands on. Hasn’t everyone always wanted to build their dream bike? Since I was about 15, I certainly have. Well last winter, I broke my back (for the second time!) in a skiing accident, and I split up with my girlfriend – so I had a bit of time on my hands. I also had a refund from my season ski pass, and felt like I a project. The build has some DH bits, and some more all-mountain bits. It’s a “quiver killer” designed as a do-it-all mountain bike covering both XC and DH bases, specifically for the alps. This is not a complete custom build though. I bought a 2012 Lappiere Spicy 916 from Flying Fox. In 2012 you could not buy a frame-only from Lapierre. If you could have – I would have done just that. I’d been riding a Transition Covert in the Swiss Alps for a couple of years. The Covert is perfect, in almost every way – but with the Hammerschmidt build I had, she was a touch hefty for long alpine ascents. I guess normally, I wouldn’t change bits on a bike when I bought it – because it would get in the way of riding time. This time, though, it would be a few months before I could ride it. So I decided to sell some of the bits (Swiss prices! 😉 ) and replace them with my preferred choices. The stem on this bike is 35mm! Normally the shortest you’d go with is 50mm. This is the shortest available apart from a Mondraker style bike, that comes with a 5mm “on top” stem. They make their top tube longer to account for this – and with this medium size bike, that’s effectively what I’ve done. Mondraker developed a completely new geometry where they extended their top tube lengths, but made an almost zero length stem. The short stem gives really fast, controllable steering. And I have ended up with a medium size frame – instead of a small that I have ridden in the past. The small was a bit short, but this years medium was long, which suited me better as someone with short legs and a long body. The longer top tube still gives you cross-country style climbability with you stability as well as more weight directly over the front wheel. I’ve gone for the 2×10 Shimano XTR the bike was specced with. If I was in the UK I’d go for a 1x set up, but over here in Europe, a 2x works a treat because there is more climbing. Unfortunately there was a design fault on the mech hanger on previous Spicys – they only had one bolt. 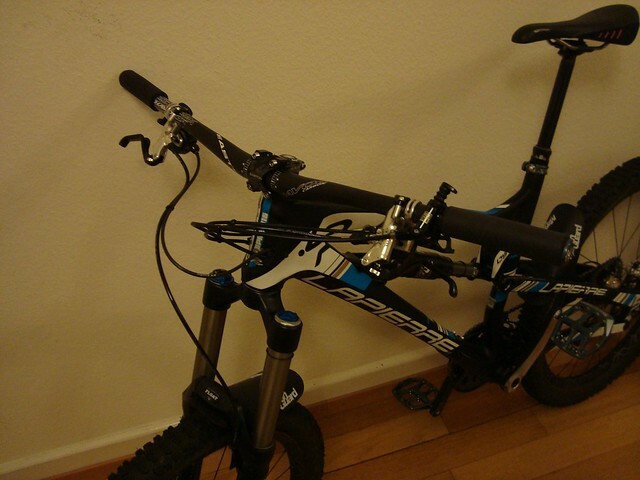 My first day riding it in Zermatt, and I hit the rear mech on a rock, damaging the frame. Thankfully Flying Fox (and Steve at Hotlines) were legends with the warranty, and sorted me out with a 2012 rear end to tide me over, and then a 2013 frame. Lappy have now sorted it, and changed the hanger to a more standard 2 bolt design (like everyone else!). I went for a carbon bash guard from Carbocage. It was designed to pair up with their single ring guide – but they were happy to sell it on its own. It required a fair bit of filing to get it flush enough with the frame for the 2x set up, but that combined with a couple plastic washers (from an e-13 bottom bracket and crankset), and it fitted a treat. I couldn’t really find many bash guards that would fit with the XTR 2x set up. If their Saint one comes out I might try that too. The Carbocage one does slide over rocks nicely though. I had been pondering a Whyte 146, so I couldn’t help reading about the carbon Haven wheels. Silly price though, so I couldn’t allow it. That was until I spotted a set massively reduced, and I realized selling the new aluminum set would get close to paying for them. Marsh Guard is such an easy and light solution to mud in the face I thought I’d give it a try. I accidently ended up with two, so I thought I’d try one on the back and see if my riding pack ends up any less wet. It’s probably not worth having on the back though. The specced 711mm Easton carbon Haven bar was changed to a 750mm Easton Carbon Havoc bar – that was a no brainer. The 70mm Haven stem was ditched for a 35mm Havoc. This was a tricky one, I was trying to make the the length as similar as possible to my Covert – and I do like a short stem, but I was worried that this was perhaps a bit too short. Seatpost – I couldn’t resist making use of the stealth cable routing on the 2013 Spicy frame. The stealth reverb adjustable seatpost comes in a 150mm extension model – which measured up exactly right for me and on a 160mm travel bike it makes sooo much difference. You can pedal uphill with full leg stretch then slam it down into downhill mode easily. The internal cable routing of the Spicy is just perfect. The frame came with a cable run through to make the reverb routing easy. The little plastic clips that you get with the reverb were perfect for making the front end super neat. My previous pedals had died, so I couldn’t resist going for the Hope F20’s. I’ve left the centre to pin spots free, to give them a touch of a concave feel. The hope grip doctors pair up nicely with the ESI silicone grips and help protect the carbon bars. The ESI Silicon grips are not lock ons. They are super grippy and more shock absorbing, but also way lighter than lock ons. This enabled me to add Hope end plugs. So far I’m pretty happy with the Fizik Gobi saddle – and I’m resisting the carbon model! I do like the compression adjust on the Fox 36 Floats, compared to the previous oil bath model I had. Had I been choosing I’d be giving the Boss deville forks a closer look mind! She’s come in at bang on 12.6 Kilos (27 pounds). OK, I’ll admit it, I’m a weight weeny, and many may say that I’d get more advantage by loosing some weight myself. It’s true, but I did loose the same amount as the difference between my Covert/Hammerschmidt build at 15.5kgs. All the hardware I could possibly change is Ti! She was named after the Malaysian for chilli sauce – Sambal. Spicy – gettit? 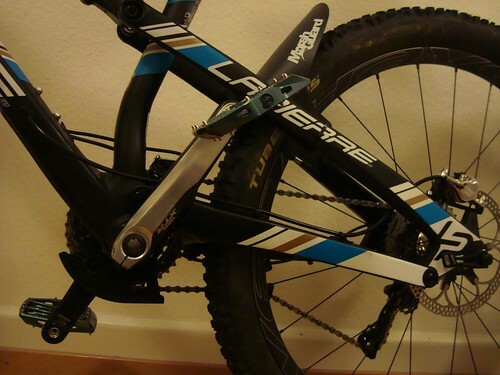 This entry was posted in Cycling kit and tagged bikes, mountain biking on February 26, 2013 by Chris Philipson.